Interested in Space Law? Apply for a weekend conference! Save the Date: Eagles Watch Party – October 7th in the 3rd Floor Lounge at Barrack Hall – RSVP! Join OCS and a panel of public interest attorneys for a discussion on careers in public interest law. Join the OCS and a panel of litigation attorneys from large, medium and small firm practice for a discussion about litigation careers and career paths. Join OCS and a panel of attorneys specializing in various areas of transactional practice for a discussions about transactional work and career paths. Learn about volunteer opportunities on campus and beyond directly from legal service organizations here in Philadelphia. Information about current project and upcoming training events will be provided. The deadline to register to vote in Pennsylvania before the November election is October 9, 2018. You can register here or here. This Space Law Network will fund legal internships at NASA, as well as bring students from all over the U.S. to numerous national conferences, where they’ll hear from leading scholars. One such conference is coming up and interested students should consider attending. A scholarship is available and the application for the scholarship can be found here. To learn more about the event, which will be held in New York City, October 18-20, 2018 click here. Improve your research skills with Westlaw Training on October 3rd from 12:00 to 1:00 pm in Klein 2A. Lunch will be served. Questions? Contact Mai Le at mai.le@temple.edu. We look forward to seeing you there. Law Student Mental Health Week is coming up. On October 10th Ballard Sphar LLP will host breakfast (avocado toast and a juice bar) to commemorate Law Student Mental Health Day. The breakfast will take place from 10AM – 11AM. Dean Mandel will begin the day and the breakfast with brief remarks. Please plan to attend at 10AM. RSVP to britt.walden@temple.edu. You are invited to take a break from studying, grab some pizza, and cheer on the Eagles on Sunday October 7th from 4-7:30PM in the 3rd Floor Lounge in Barrack Hall. Please RSVP to Britt Walden at britt.walden@temple.edu. Looking to improve your research skills on Westlaw? Come to the training October 3rd from 12:00 to 1:00 p.m. in room Klein 2A. Lunch will be served. Questions? Email mai.le@temple.edu. Students are encouraged to attend Temple Law Day on September 26, 2018 from 5-7:30 p.m. in the Becker Lobby of the U.S. Courthouse located at 601 Market Street. Temple Law alumni and members of the state and federal judiciary will conduct a panel presentation on topics in immigration law. A cocktail reception will follow. Questions? Email lcareer@temple.edu. 1L students should plan to attend a session conducted by Assistant Dean Melissa Lennon to learn about the Office of Career Services and the services and resources available. Presentations will take place on September 25th in Klein 1D from 12-1:00 p.m., September 25th in Klein 2B from 5:00-6:00 p.m., and September 28th in Klein 1D from 12-1:00 p.m. Questions? Email lcareer@temple.edu. Interested in public interest work? Please join your follow classmates, key leaders of on-campus students organizations, and Jorge Godoy, Director of Public Interest Programs, for the Law & Public Interest: Direct Services discussion on September 24th in Klein 7B from 12:00-1:00 p.m. Questions? Email lcareer@temple.edu. On September 25, 26th, and 27th for 1L day students, and September 26th for 1L evening students, ACE counselors will be holding sessions on how they synthesized for Contracts, Torts, and Criminal Law. As these sessions are subject specific, not section specific, rules and synthesis will be covered throughout all sessions, so please know you can attend one session as you see fit. Food will be provided. Questions? Contact Mai Le, Associate Director of Academic & Professional Success, at mai.le@temple.edu. The American Inn of Court is a national organization dedicated to increasing collegiality within the legal profession. Local chapters of practicing attorneys meet regularly to learn from each other, socialize, and generally be collegial. 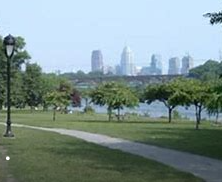 We are fortunate that in Philadelphia, there is an Inn of Court chapter specifically for environmental law practitioners. This is a genuinely nice group of roughly 80 or so area environmental attorneys, representing a broad diversity of practice areas and perspectives. There are big firm lawyers, small and medium firm lawyers, government lawyers from the federal, state and local level, administrative law judges and public interest lawyers. They all come together once a month on Wednesday evening from about 5:30 to 7:30-8PM. The first hour is purely social (with food and drink provided) and during the second hour, a subset of the larger group puts on a continuing legal education presentation. Student members are assigned a mentor and are also included in these small groups that organize group presentations. Each year, the Delaware Valley Environmental Inn of Court invites 2 students from each of the area law schools (including Temple) to join. For students interested in a career in environmental law, especially one in the Philadelphia area, this is a great networking opportunity. If you are interested in being considered for membership this year, please email Professor Amy Sinden, amy.sinden@temple.edu, by Sunday, Sept. 23rd with a resume and a paragraph explaining why this opportunity is of particular interest to you. The Amy Court of Criminal Appeals will be holding oral arguments in the Moor Court Room on Wednesday, September 26, 2018. This is a tremendous opportunity to watch a complete appellate argument. You will also be able to meet and engage with the advocates as well as the judge. It is a chance to discuss not only the process but a legal career with the military. The hearing and Q&A will be from 3:45 p.m. – 5:15 p.m. Registration is open for all graduating students (January and May grads) interested in the Certificate in Litigation and Trial Advocacy (registration deadline is September 28, 2018). You must register to earn the Certificate. To learn more about the Certificate, please see the website here: https://www.law.temple.edu/academics/degrees/certificates/litigation/. The registration form can be found here and should be returned to either Professor Jacobson in Klein Hall 614 or to Mary Beth Wilson in Klein Hall 612. Questions? Please email Prof. Sara Jacobson, Director of Trial Advocacy Programs at sara.jacobson@temple.edu. 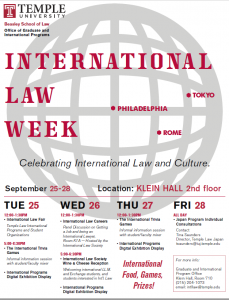 Temple Law will be celebrating International Law Week September 25-28 in Klein Hall, 2nd Floor. Please join students, faculty, staff and alum for the programming throughout the week. 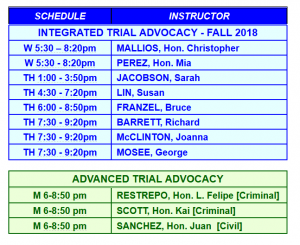 Certificate in Litigation and Trial Advocacy – Registration Open! Teaching Assistants Needed for Fall 2018 Trial Advocacy Programs – Apply Here! On Monday, September 17, 2018, the Office of Career Services will be hosting a discussion with 2L/3LE students as they move past OCI, and begin to explore next steps in continuing the summer job search process. There will be two presentations, the first is from 12:00-12:50 pm in K2A and the second is from 5:00-5:50 pm in K1D. Questions? Email lcareer@temple.edu. The next ACE session will be held on September 18th (1L day students) and September 19th (1L evening students). Prof. Shellenberger and Associate Director of Academic and Professional Success, Mai Le, will teach you the important skill of synthesis – the process of integrating a rule from several cases. Food will be provided. Questions? Contact Mai Le at mai.le@temple.edu. We look forward to synthesizing with you next week. Come join Professors Levy and Morrow begin this Saturday, September 15 to build community and find balance along Kelly Drive. All fitness levels are welcome! We will begin at 11AM at the Art Museum steps. RSVP to britt.walden@temple.edu. Friends, family, pets welcome! The following instructors are in need of an assistant. Payment is $10/hour. Work Study is preferred, but not required. Interested students should contact Ms. Mary Beth Wilson at mwilson6@temple.edu ASAP with the available time(s) you would like to be assigned. NOTE: This appointment fulfills one of the requirements for the ‘Trial Advocacy Certificate’ program. In an effort to get information about the Bar Examination and the Character and Fitness process to our students earlier, we are delighted to let you know that the Pennsylvania Board of Law Examiners will visit the law school on September 18th at 12PM (in K1D). This event will be live-streamed so that all can participate. The PABOLE will discuss the Pennsylvania Bar Exam and admissions process. This is a helpful presentation that includes information about the character and fitness process and we hope you will attend. The PABOLE will be here again in the spring, however we encourage all graduating students to attend the fall presentation so that you obtain any necessary information early (the Character and Fitness process can be involved). Questions? Please email jennifer.bretschneider@temple.edu.